Take Wai`alae exit 26B, turn right onto Hunakai St. Take a left down the ramp to the first floor mall level. Keep straight and look for Kahala Office Center on the right. Our office is on the first floor, Suite 102, look for our sign. Parking is free all around the mall. Take Kilauea exit 27. Stay in the second to the left lane and turn left at the light onto Kilauea Avenue. Take a right at the first stop light and go straight until you see Title Guarantee on your left. We are on the first floor to the left of Title Guarantee, Suite 102. As you get closer you will see our outside sign. Parking is free all around the mall. All of Kahala Mall has the address 4211 Wai`alae Avenue so google maps will take you to the whole mall and cannot direct you specifically to our office. If you use google maps, use our map after to get you to our office. Please feel free to call if you get lost. 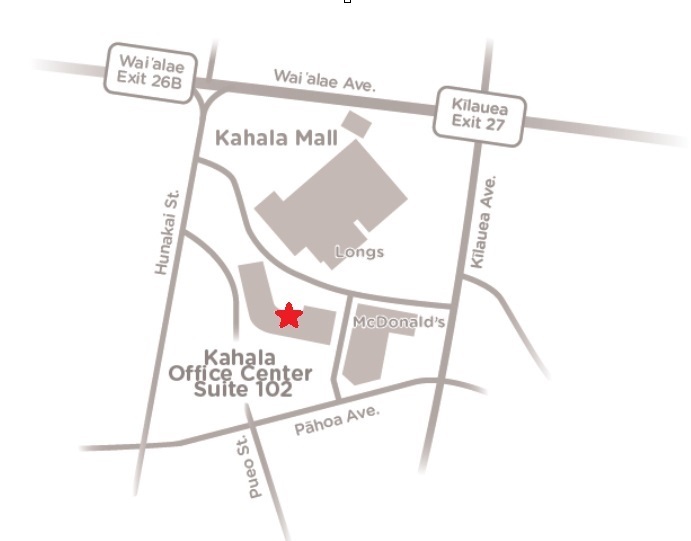 We are located at the back of Kahala Mall with plenty of convenient and FREE parking!